Ahead of the 70th anniversary of the Tehran Conference, Rossiyskaya Gazeta deputy editor-in-chief Nikolai Dolgopolov presents a new book about the Soviet spy team of Gevork and Goar Vartanyan. Nikolai Dolgopolov latest book, "Gevork Vartanyan," is devoted to the recently deceased Hero of the Soviet Union, undercover agent Gevork Vartanyan and his wife, Goar. They are considered to have been the best performing couple in the history of Russian undercover agents. Dolgopolov previous books, which came out in the “Outstanding Lives” series of the Molodaya Gvardiya publishing house, have become bestsellers. They were devoted to Colonel Abel (Fischer) and Kim Philby. 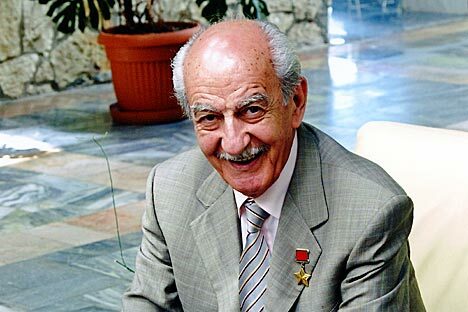 Little is known about Vartanyan, but it is universally acknowledged that he played a key part in preventing an assassination attempt against the three Allied leaders during the 1943 Tehran Conference. In the excerpt below, General Yuri Drozdov, who for many years was in charge of undercover operations, remembers the Vartanyans' supervising officer. Yuri Drozdov: His last name was K. Unfortunately, he died very young. Information about him still remains classified, and it is unlikely that his name will ever become public. However, some of the operations which he took part in did become public. In the relevant files K. features as a colonel. And is there nothing more about him? Y.D. : K. himself experienced what the Vartanyan's had to go through. He had the relevant papers. Once, to confirm his legend, an unthinkable thing had to be done. Thanks to his gift as an intelligence officer, a blind woman from a remote village in the mountains who had never seen him before, identified him as her son. Thus he now had a real mother from the Arab east. Yet, judging by his name, Colonel K. was an ethnic Russian, or was he half-Russian? Y.D. : No, he was not Russian. He was from Ossetia. When K. had some difficulties with verifying some aspects of his legend, he wrote to the people who were supposed, under his legend, to be his relatives. Their real son had not visited home for more than 15 years. It turned out that his mother had grown blind. K. was convinced that there would not be such a great risk were he to meet those relatives to confirm him legend. However, his superiors at the Soviet foreign intelligence service thought that it was a too daring thing to do. The associated risks, if not surpassing all the admissible boundaries, were very much near to them. Still, after much deliberation, weighing pros and cons and much hesitation, K. was given permission to proceed. Just in case, several kilometers from the village, a car was waiting for him. The driver had papers in which K. was given a different name, and an airplane ticket to one European country with a stopover in another. Had things turned unfavorably for him, had the elderly woman failed to recognize him as her long-lost son, and the main thing for him would have been to catch that plane. Y.D. : You are right, the guy from that mountain village made a very good career. He got a job with a European firm, made good money. At first he even visited his home village, sent presents home, but then he suddenly vanished. And he could have just as suddenly re-emerged? Y.D. : No, he could not. He was dead. K. learned of this quite by chance. And he was struck by how similar they looked. That was why he risked meeting the mother. Yuri Ivanovich, yet it is not for nothing that people say that a mother will always recognize her son. Y.D. : That's true. I agree: a mother could always recognize her son. But would she have told the poor or not very well-off people around her, living up there in the mountains, that the man was a stranger? Her son had disappeared 15 years ago. K., like his "double," had built a successful business career abroad. He was earning enough money to be able even to help his fellow undercover agents. He had warned the relatives of his arrival in advance. He sad brought presents for everyone, as is the custom in that part of the world. The mother was ready to accept and embrace her prodigal son. K. was very well dressed, had arrived in an expensive car. How could the relatives, especially his mother, reject him? All right, even if he was not her son. But he sincerely believed the elderly woman to be his mother, so why push him away? Y.D. : He had an explanation ready for a possible "what if." K. would have asked his relatives whether his mother was quite herself, would have shown everybody a family picture made some 20 years before, when the son was visiting the village. His resemblance to the dead man was uncanny. How could one reject a relative like that? It seemed that everything had been thought of. Y.D. : Indeed, it is impossible to think of and foresee everything. The whole village came out to greet him. There was a whole procession leading K. to his mother. On a bench next to the family's home, there were several women sitting, all wearing burkas. Of course, it was practically impossible for him to recognize his "mother." However, while K. was frantically deciding what to do, his blind mother rose from her seat. Supported by her neighbors, who must have identified the approaching well-dressed man as her son, she kneeled before him. She felt his whole body with her hands, said a prayer to Allah and called our colonel her son. She accepted him. Which country did it all take place in? Although, as I am looking at you, Yuri Ivanovich, I realize that I should not even try to guess. Y.D. : No, you shouldn't. We did a lot to substantiate that whole legend. Our colonel lived the life of a rich man. All the gifts to his numerous relatives had been funded by his European firm. He refurbished the house, repaired the roof, put up a new fence. However, his business, and that was absolutely true, did not allow K. to remain in his now home village for long. He had to leave three days later. Europe awaited him. Y.D. : You know, there was nothing immoral, ill-spirited or ungrateful there. On the contrary. We paid a pension to his mother, which went to the relatives who were looking after her. And for more than a decade we transferred money to the village where she lived. Incidentally, it may well have been that it was the meeting with her son, the material prosperity and comfort and the care of the relatives who were encouraged by the constant aid they received that helped her to live longer. Yet, as far as I understand, she never saw her son again, did she? Y.D. : You yourself mentioned the risks. The colonel was involved in most serious operations in the Middle East and beyond. Couldn't you just hint at what he managed to do? Y.D. : I am afraid nobody will ever be able to tell you any details. As for hints… K. was the first of our agents, long before the others, to inform the center of the star wars project. Do you mean U.S. President Ronald Reagan's "strategic defense initiative"?